Gangding Station in Guangzhou, China. Day 1 of Transforming Transportation continued with three parallel sessions and a plenary focused on governance. Photo by Benjamin/Flickr. Cropped. 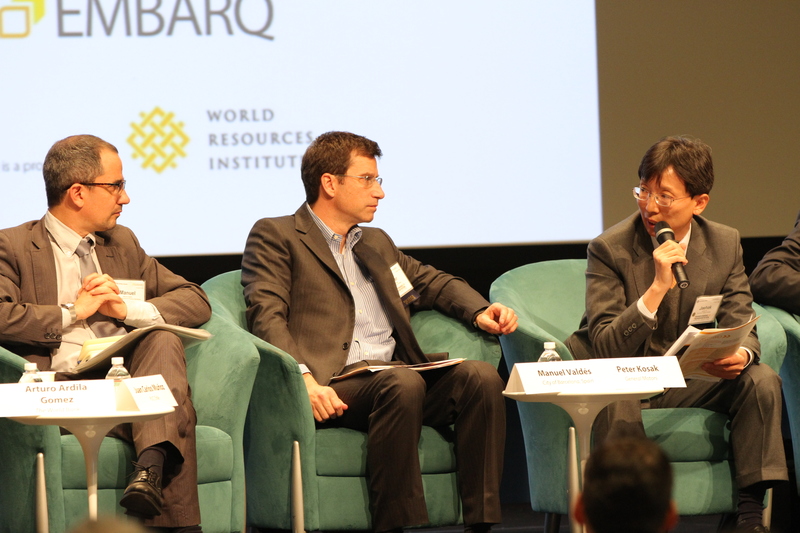 EMBARQ, the sustainable urban transport and urban development program of the World Resources Institute (WRI), and the World Bank are co-organizing Transforming Transportation on January 16 and 17 in Washington, D.C. Join the conversation on social media with hashtag #TTDC14, by following @EMBARQNetwork and @wbsustaindev on Twitter, and tune in to www.transformingtransportation.org for video streaming of select sessions. The “Integrated Mobility” session was moderated by Juan Carlos Muñoz, professor in the Engineering Department of Transportation and Logistics from the Pontificia Universidad Catolica de Chile (PUC). The panelists included Arturo Ardila, Senior Urban Transport Specialist, East Asia Region, The World Bank; Manuel Valdés , City of Barcelona, Spain; Peter Kosak, Executive Director, Urban Active Solutions, General Motors; Jaehak Oh, Vice President of KOTI, Korea; Michel Pellot Garcia, Director of Research & Development and Internationals Affairs at Transports Metropolitans de Barcelona; and Patricio Perez, Director of the Metropolitan Public Transport System in Santiago de Chile (DTPM). “When people move around in cities, they generally use more than one mode of transport,” opened Muñoz. That’s the essence of integrated mobility – a system of diverse modes of transport, from bus to metro and bike-share to private vehicles, operating with seamless connections, enabling urban residents to take full advantage of a range of sustainable transport options. The panelists in this session represented several cities, including Barcelona, Spain; Seoul, South Korea; and Santiago, Chile, that are taking steps towards achieving integrated mobility. As Ardila articulated, “Integrated transport systems are the backbone of any city,” beneficial to urban residents and the public and private sectors alike, because integration can reduce the total negative externalities of urban transport systems – including traffic crashes and fatalities. During the panel, Ardila argued that people should be free to buy a car, but when they use it they should have the option of high-quality public transport systems, so they are not a slave to a car. 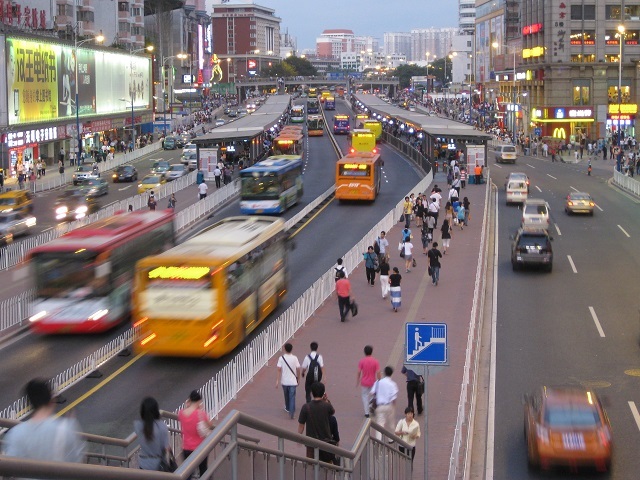 He also stressed that given the radical behavior changes of the millennial generation – which research shows increasingly prefer public and non-motorized transport over private vehicles – and the differing travel patterns of women and men – women ride public transport more frequently than men – improving public transport to ensure greater inclusiveness has never been more critical. From left to right: Panelists Manuel Valdés; Peter Kosak; and Jaehak Oh during the “Integrated Mobility” break-out session at Transforming Transportation 2014. Photo by Aaron Minnick/EMBARQ. Public transport is not necessarily a business – it is a business, it should be efficient – but it should also be a socially inclusive service for all people. The contrast between private companies offering a public service is a key issue, and not an easy one. I’ve never seen a more exciting or more disruptive time for transportation. The goal of the third plenary, “Managing Governance: Overcoming Barriers to Sustainable Transport,” discussed the different challenges that arise when centralizing urban transport management. Several cities around the world are beginning to recognize the complexities of urban transport and the fact that multiple agencies, often reporting to different levels of government, are responsible for various aspects of transport in the same city. These agencies rarely coordinate their efforts, which often leads to duplication of efforts, a waste of public resources, and sub-optimal transport systems. To overcome these barriers, the need for a lead transport agency is being increasingly recognized in cities across the globe – but as the panelists discussed, that process is not an easy one. 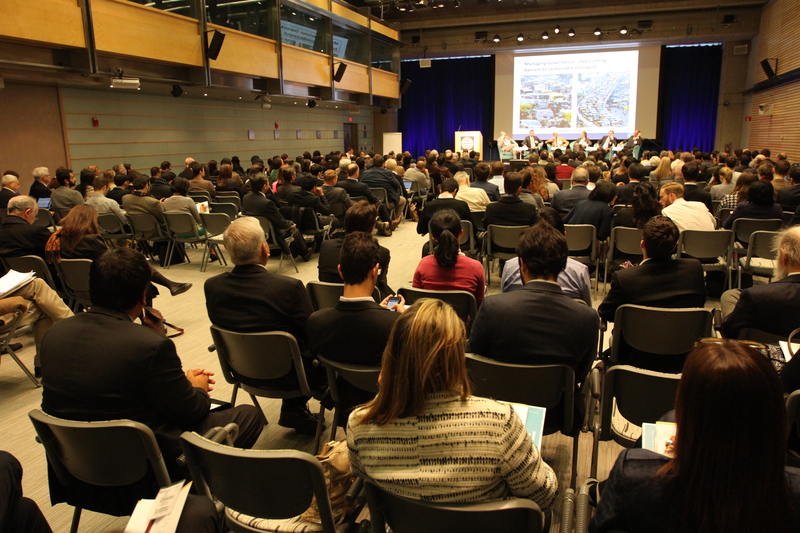 A packed crowd fills the Preston Auditorium at the World Bank headquarters during the “Managing Governance” plenary at Transforming Transportation 2014. Photo by Aaron Minnick/EMBARQ. Day 1 of Transforming Transportation 2014 concluded with a recognition of the 2013 Lee Schipper Memorial Scholarship for Sustainable Transport and Energy Efficiency recipients – Mr. Sudhir Gota and Ms. Fei Li. Next week on TheCityFix, we’ll have a re-cap of both Gota and Li’s research presentations, as well as a Q&A. Stay tuned for continued coverage of Transforming Transportation tomorrow on TheCityFix! In the meantime, join the conversation online using hashtag #TTDC14 and by following @EMBARQNetwork and @wbsustaindev on Twitter. Tags: D.C., finance, Integrated Transport, North America, sustainable urban transport, Transforming Transportation, TTDC14, United States, urban governance, Washington, D.C.